TOKYO — Record rainfall continued to batter Japan on Sunday, with millions of people being urged to leave their homes because of the risk of flooding and landslides that have already killed dozens. Government officials pleaded with affected residents to “take adequate actions and follow evacuation instructions issued by municipal governments” as forecasters predicted more rain in western and central Japan. The flooding had killed at least 68 people by Sunday afternoon, and 56 more were missing. More than three million people were told to move to safer places such as school buildings or municipal shelters. Mr. Kajihara said the rainfall between Friday and Saturday in western and central Japan had broken a record for a 48-hour period dating back 50 years. In Gifu Prefecture, for example, more than four inches of rain fell in just one hour overnight. Prime Minister Shinzo Abe set up an emergency task force to deal with the worsening situation. The situation was particularly dire in Kurashiki City, in western Japan. More than 1,000 people were waiting to be rescued, many from rooftops. At one building, drone footage showed the words “SOS” and “150 people! water and food” on a sheet on the roof. At a hospital, officials used helicopters to rescue patients and staff members, with babies and children being pulled to safety first. The hospital is not far from a riverbank that was wiped out by the flooding. Many people died because they were unable to flee. In Kagoshima Prefecture on the southern tip of Japan, a couple believed to be in their 80s were found dead after landslides destroyed their house. In Kyoto Prefecture, two people were found buried in mud where two houses had collapsed from another landslide, the public broadcaster NHK reported. 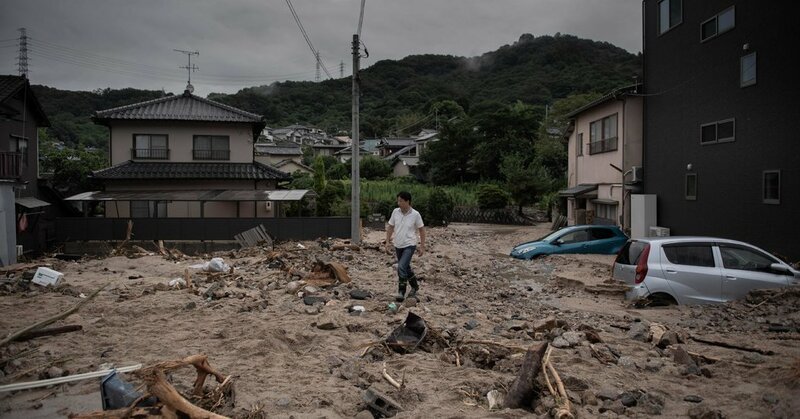 In Hiroshima Prefecture, a 3-year-old girl was missing after debris from a landslide poured into her house. The rains crippled transportation networks, with bus and train services partly or completely shut down in 15 prefectures. But the Shinkansen bullet trains were still operating on Sunday. At least 34,000 homes in western Japan were without power, and recovery work was difficult because many roads were cut off by landslides. Itsunori Onodera, Japan’s defense minister, told reporters that the weather was expected to take a turn for the better, but that many problems remained. “The weather is expected to recover and it’s going to be hot,” he said. “There are many cases of disconnected water supply,” he added, saying that officials were trying to provide relief so people would have access to drinking and bath water. Hisako Ueno reported from Tokyo; Makiko Inoue from Matsue, Japan; and Gerry Mullany from Hong Kong.